A Welsh demolition contractor has been fined £30,000 after two of its workers were injured when a mezzanine floor collapsed on them. Cardiff Crown Court heard that two employees, who do not wish to be named, were dismantling the internal structure of a building at the former NEG factory on Ocean Way in Cardiff in September 2008. 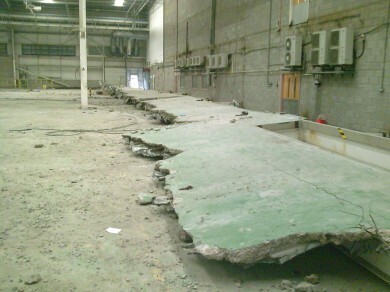 As part of the work a mezzanine floor needed to be demolished. Most of the mezzanine floor had been removed without incident but an alternative method was required for the last section in order to protect air-conditioning units fixed to the end wall. The method of work adopted for this last section of the mezzanine floor was significantly different and more complex that had been adopted previously. One employee sustained cracks to his spine and lost the toes and ball of his left foot resulting in him needing a prosthesis. His colleague suffered multiple fractures to his arms, a dislocated elbow and cracked ribs, as well as severe bruising to his back and kidneys. Wrexham Demolition & Dismantling Ltd of Neath Port Talbot pleaded guilty to a safety breach and was fined £30,000 and ordered to pay costs of £100,074. 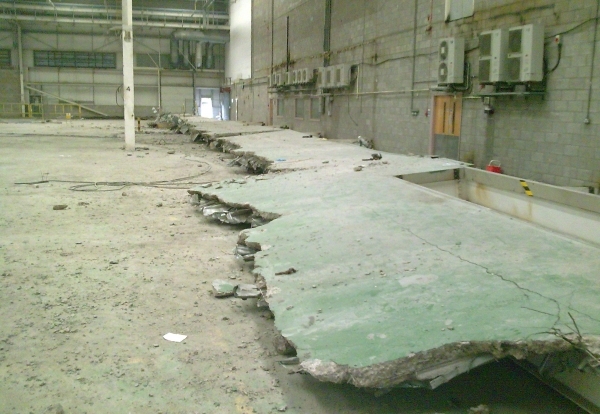 Speaking after the hearing, HSE Inspector Wayne Williams said: “Two employees of Wrexham Demolition and Dismantling Limited were involved in pre-weakening the supporting pillars of a section of mezzanine floor when it collapsed upon them. “The direct cause of the accident was the choice of a totally unacceptable and dangerous method of work to demolish this part of the floor section. “The likelihood of the floor prematurely collapsing due to this work was entirely foreseeable but it had not been taken into consideration. “The company failed to ensure that the work was adequately assessed, planned and supervised. Consequently, no preventive or mitigating measures had been put in place to reflect the risk of the floor collapsing while the men were working beneath it. “Both men were put in considerable danger by the choice of the method of work employed by Wrexham Demolition.